Guinean minister of Planning and the president of the Islamic Development Bank (IDB) group have, on the sidelines of the regional conference on the Waqf opened Wednesday in Conakry, signed a $16.25 million financing agreement aimed at boosting production rice through the Rice Value Chain Program. “The Regional Rice Value Chain Program is a 10-country regional program that will strengthen the capacity of IDB member countries towards the strengthening of the agricultural sector and achieve self-sufficiency in food production. Guinea is part of these countries,” IDB Group President Dr. Bandar Hajjar said. The main objective of the project is to contribute to reducing the quantity of rice imported into Guinea, enhancing the economic growth through the improvement of production and productivity in a sustainable manner and strengthening the participation of the private sector. 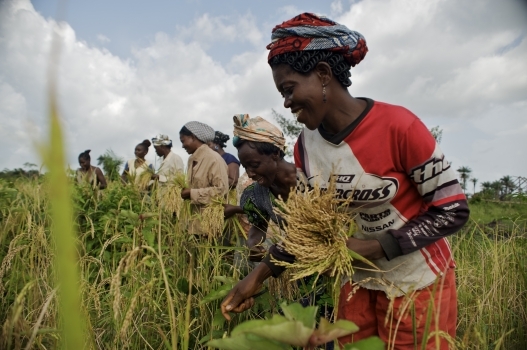 “Upon completion, the program should allow Guinea to increase its rice production by 25% and to reach self-sufficiency in production from 69% to 85%,” Mama Kanny Diallo, the minister of Planning declared. Guinea is one of the founding members of the IDB group, which has invested a total of US$982 million.